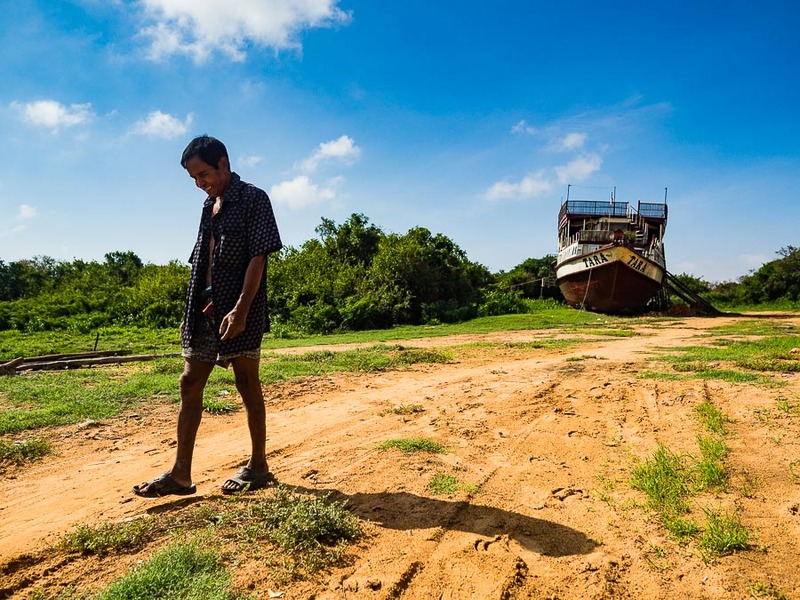 A worker walks away from the Tara, a riverboat that has been left high and dry because of the drought in Cambodia. The Tara was built in a French shipyard in Vietnam (then a French colony) in 1927 and survived the three wars in Indochina - World War II, the Vietnamese War for independence against the French and the Vietnamese war against the US. Most recently, the Tara has been taking tourists on cruises across the Tonle Sap, Cambodia's great lake. The owner is refurbishing and repairing the Tara during the drought and hopes to refloat it during Cambodia's seasonal flooding. I've been documenting the drought in Thailand for almost two years now. The situation in rural Thailand is dire - farmers don't have water for their fields and people's wells in the countryside are running dry. But as bad as the situation is in Thailand, it's much worse in Cambodia. A farmer plants rice in his fields near Seam Reap. The land is dry as concrete but the farmer, who has been farming in the area all his life, said this is the driest his fields have ever been. He said normally at this time of year there are 3 - 5 inches of water in the field. He said he was worried about whether or not his rice crop would survive but that he had no choice. If he didn't plant, his family wouldn't survive. Better to plant and hope for the best. Walking through the field, planting rice. 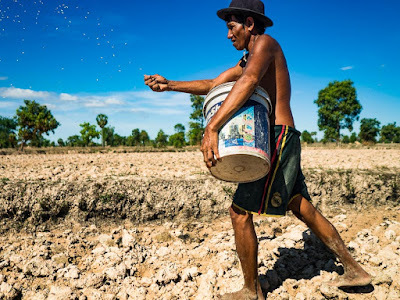 The drought in Cambodia is the same drought impacting Thailand and Vietnam. All of Southeast Asia is wrestling with it. The drought was spawned by the strong El Niño weather pattern that also dried out subSaharan Africa, India and Australia. There's enough rice in storage to get most people through this season, into November. But if the rainy season or the crops fail there could be significant food shortages. There have already been spot shortages of proteins throughout Cambodia. Fish is the most important source of protein for most Cambodians. There have been large fish die offs in Cambodia's lakes and reservoirs as water levels have dropped. The West Baray, a reservoir west of the Angkor complex. The West Baray is a huge reservoir dug by the ancient Khmer empire in the 11th Century AD. It's 7.8 kilometers long X 2.1 kilometers wide (4.8 miles X 1.3 miles). This year it's essentially empty for the first time in living memory. Water from the Baray irrigates the rice fields and fish from the Baray feed the people. Now there's neither. The Cambodian government was running some drought relief operations, trucking water into rural villages, but ended those when the rainy season was supposed to start. 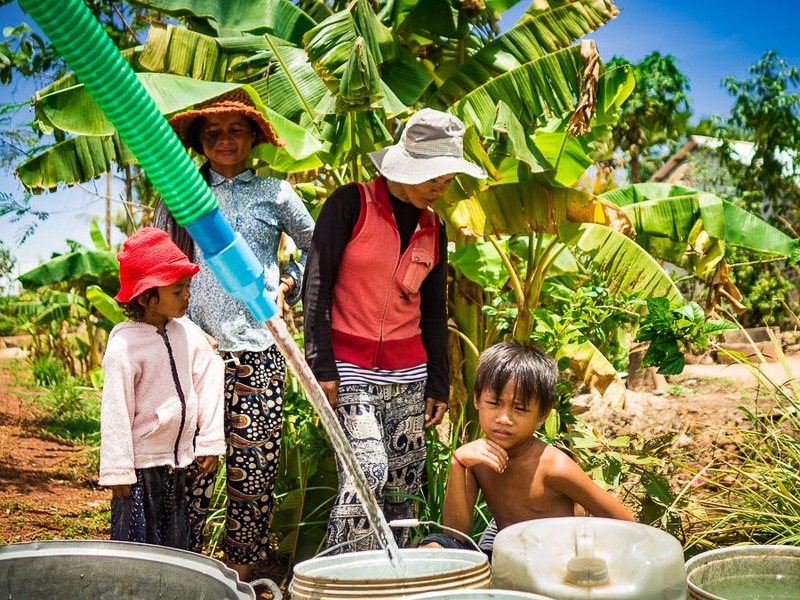 Some NGOs are still working to provide water to rural Cambodians. 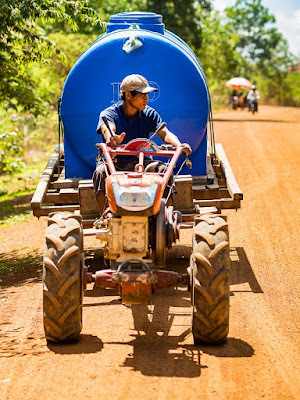 I rode with Water on Wheels (WoW), a Siem Reap based NGO, that delivered 7,000 liters (1,850 US gallons) to people in Sot Nikum, about 45 minutes from downtown Siem Reap. About 150 families (600 - 800 people, Cambodians still have large families) rely on the WoW water. Earlier in the week, WoW delivered about 10,000 pounds of rice to another part of Sot Nikum. 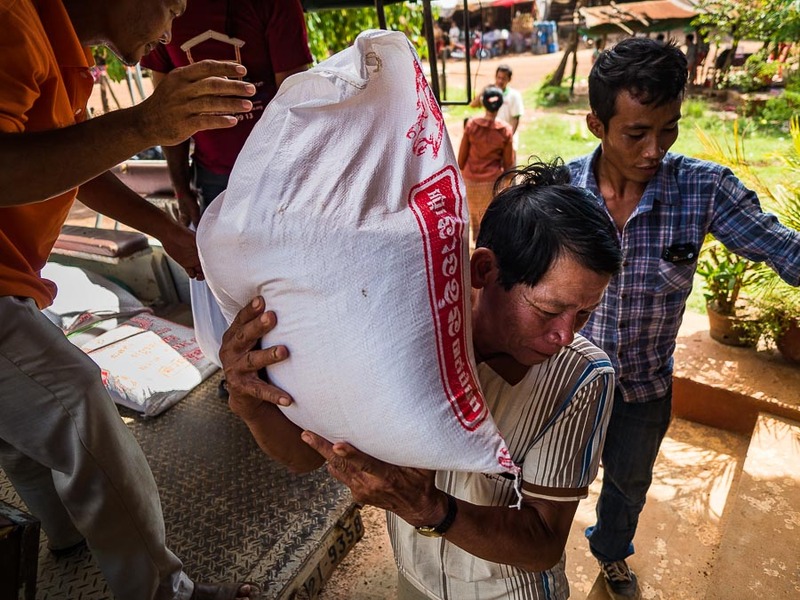 Although there aren't rice shortages in Cambodia yet, farmers' income has dropped because crop yields have dropped due to the drought. The poorest farmers in the countryside can no longer afford to buy rice to feed their families. A Water on Wheels rice delivery to Sot Nikum. 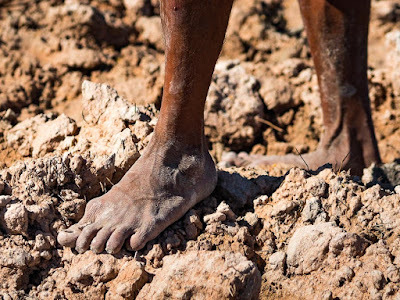 In some cases, the Cambodian government is making the drought situation worse. 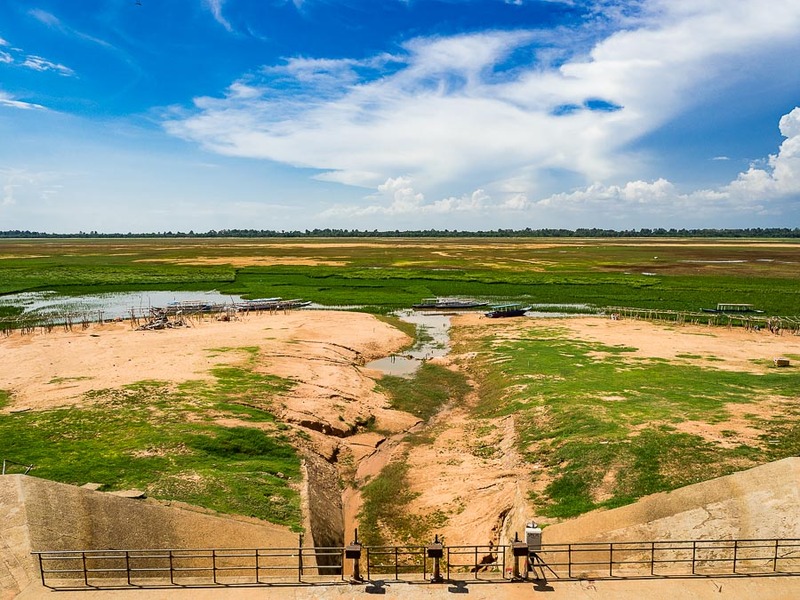 The wells in Pouk, a district west of Siem Reap went dry in late February. In March, the government opened a public water point near the district to help people weather the crisis. An empty water tank near Pouk. This is still the traditional dry season, but the tank has never been this empty. At the public water point near Pouk, a man cools off his son. People line up all day long to get water here. People use the water point, a public tap near a deep well, all day long. Every day. 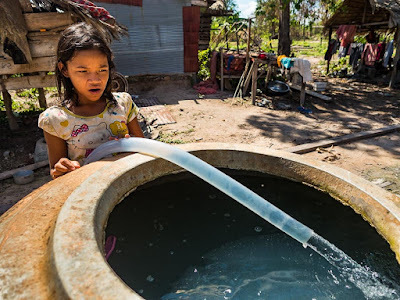 Last week, the government announced that in order to save water for Siem Reap town, they were going to close the tap four days a week. People in the area would be allowed to access it only two or three days a week. If it doesn't rain, the people of Pouk will be left high and dry. Even if it does rain, it will take months before the water levels are high enough to provide usable water to the people. 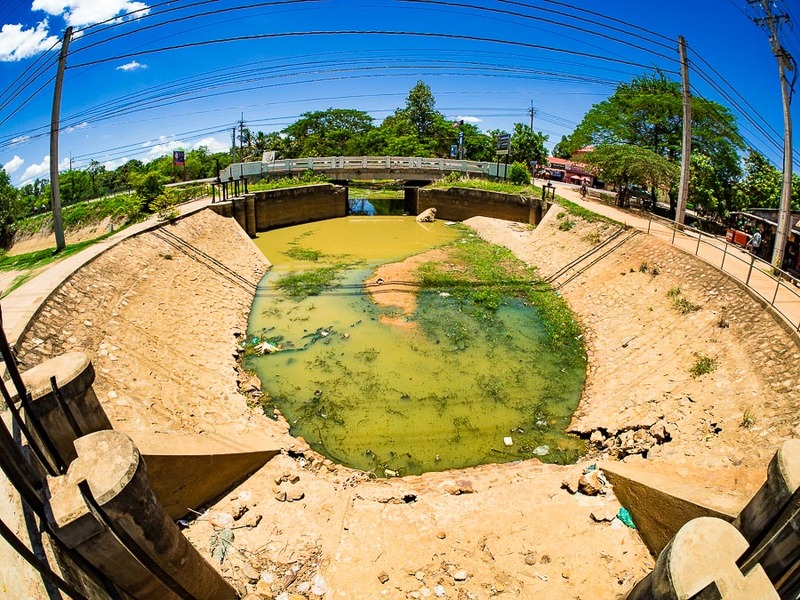 (Groundwater contamination is a problem in Cambodia, especially early in the rainy season, when the runoff is contaminated with chemicals used to treat crops.) The people of Pouk, and other communities west of Siem Reap will be forced to rely on water sellers and NGOs for drinking water. Villagers watch Water on Wheels volunteers fill their water jugs. A water seller drives through the countryside. Water sellers, like this one, and NGOs are the main source of drinking water for many people in the countryside. The water sellers provide an important service to the community and many of them have put their own resources into selling water. The man above bought the water tank for his tractor, uses water from his well (which is much deeper than most of the other wells in the area) and pays for his own petrol for the tractor. How much he charges customers depends on how far he has to haul water. But many rural Cambodians are desperately poor and cannot afford to buy water. The thing is that trucking water is horribly expensive and not sustainable. It contributes to global warming and has a large carbon footprint. The water sellers and NGOs provide a life sustaining service but at a huge cost. At this point though there is no option to their services. Drought in Cambodia (and Thailand and Vietnam) is different from drought in the Southwestern US or Australia. There's still some water in the countryside (which is why there are trees and some greenery) but there is nowhere near enough water to irrigate crops and domestic water supplies, like wells, are running dry. As the wells go dry and surface water disappears, the infrastructure is damaged. Salt water and other contaminated water gets into the system and has to be flushed out, roads and buildings collapse from subsidence. Even if Cambodia has a normal rainy season, the water deficit is so deep that the situation will persist. It's a problem that could take years to correct. A child watches water she bought from a water seller fill the jars at her home. She stayed home from school to help her family find drinking water. People in the west, and developed urban areas in Asia, take water for granted. We open the taps and water flows. But that's not the case in the areas hit hardest by drought. Rural Cambodians spend hours every day and dollars they don't have to secure water for their homes. I was at the water point in Pouk for two hours. I watched people make repeated trips to the well to fill their water jugs. A girl at the water point near Pouk fills a jug on her bike. She said she spends 5 - 6 hours a day collecting water for her family. She only went to school half time because she was so busy collecting water. It's impossible to say how much her life will be hurt by the drought. The man cooling off his son at the Pouk water point said he made four or five trips per day to the well to get water. That's time he can't spend working in the fields, looking for a job or taking care of his children. There's a lot more to contending with drought than just a shortage of water. There are more photos of the Cambodian drought in my archive or available from ZUMA Press.